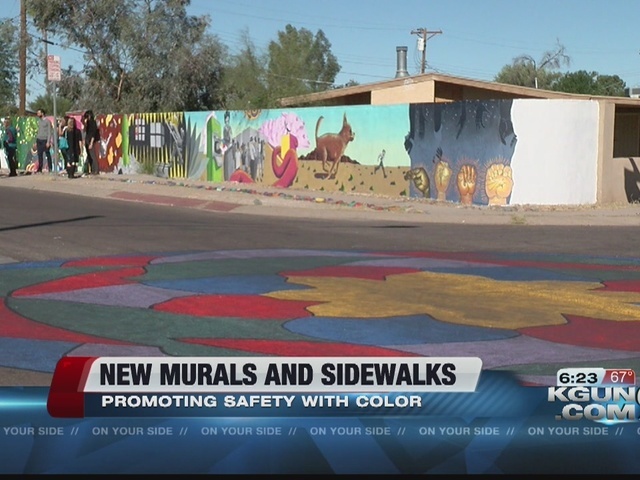 City officials, teachers and students celebrated new murals and crosswalk art decorating Pueblo Gardens Pre K-8th Grade School. Living Streets Alliance, a local non-profit organization, won a $20,000 grant from the KaBoom! Play Everywhere Challenge to create a low-cost street safety project. "To come out and actually be with the future of our community and knowing that that future down in Pueblo Gardens down at 36th Street and Campbell is where our strength is going to come from makes me feel great," said Mayor Rothschild. More than 70% of the students live within a quarter mile of the school and walk every day. The goal of the art is to make the walk safe and fun for the students. "If we have these beautiful treatments it signifies the drivers that this is a different kind of space, it is a space where there is kids so yeah signaling to slow down," said Vanessa Cascio, a Safe Routes to School coordinator. Nearly 300 community members came together to help their children with this project. "I was so excited when I was helping and I was crying as I was painting I felt very special," said Sirenia Vasquez, a student's mother. "I feel very special for my daughter and the whole community." The mayor says he hopes these types of low-cost enhancements happen in other neighborhoods.